I’d like to take a moment to thank you for the love and support you’ve shown as our community begins to rebuild from Hurricane Florence. It’s because of friends like you that we can provide emergency relief and support to people in central and eastern North Carolina during this time of great need. 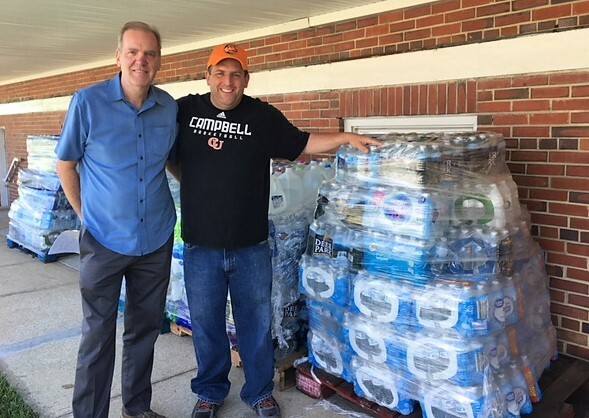 Recently we delivered three truckloads of water to Atkinson Baptist Church in west Pender County from Raleigh after receiving an urgent call from Pastor and Mayor Ken Smith. Ken told me that the town of Atkinson became an island for several days due to the rising creeks and rivers. The town itself survived, many have lost everything due to the 20 feet of water that flooded the area. Moving forward we will supply them with water, food, cleaning supplies, and whatever else they might need from our Food Bank branch in Wilmington. I shared that we will stand beside them for as long as they need us. With your generosity, we will continue to provide emergency food, water, supplies, and care. Thanks to friends like you, the people of Atkinson need not worry.